This page describes the various uses of the Urban Geological Map. 1. Using the mouse, move the cursor to the icon in the upper right corner of the map screen. 1. Move the cursor to the icon in the upper right corner of the map screen. 2. 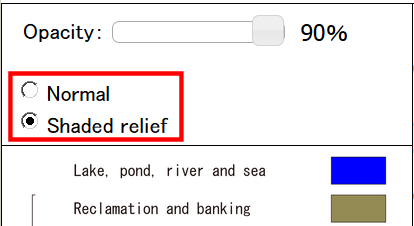 Select the box for Geological map (the Geological map is selected by default). Slide the Opacity bar in the upper left corner of the screen. A smaller value gives a more transparent map. 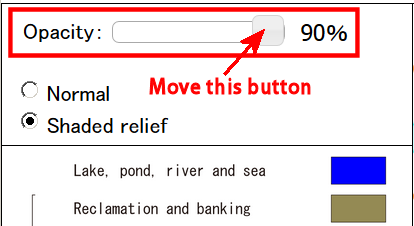 Select the radio button in the upper left corner of the screen for a Normal or Shaded relief map. Click the geological map displayed on the map screen. 2. Check the box for Borehole to view the locations of borehole data, shown by solid red circles. 1. Click a borehole location (solid red circle). 2. Click the View file link on the attribute window to see the borehole logs.